Monday Question – Do You Ever Use Perfume As A Means Of Disguise? Do you use perfume to be someone you are not? Do you take advantage of perfume’s transformative powers to enhance or downplay some of your personality traits? Do you ever play olfactory dress up? What a strange question today, you might say. I just brought my younger son to his day care group where they are having a fancy dress party for carnival today. He went dressed as a clown, despite (or maybe because?) he is extremely afraid of clowns. He insisted on being one himself today to feel powerful, I believe. Also, he is extremely cute in his outfit, but today that is beside the point. 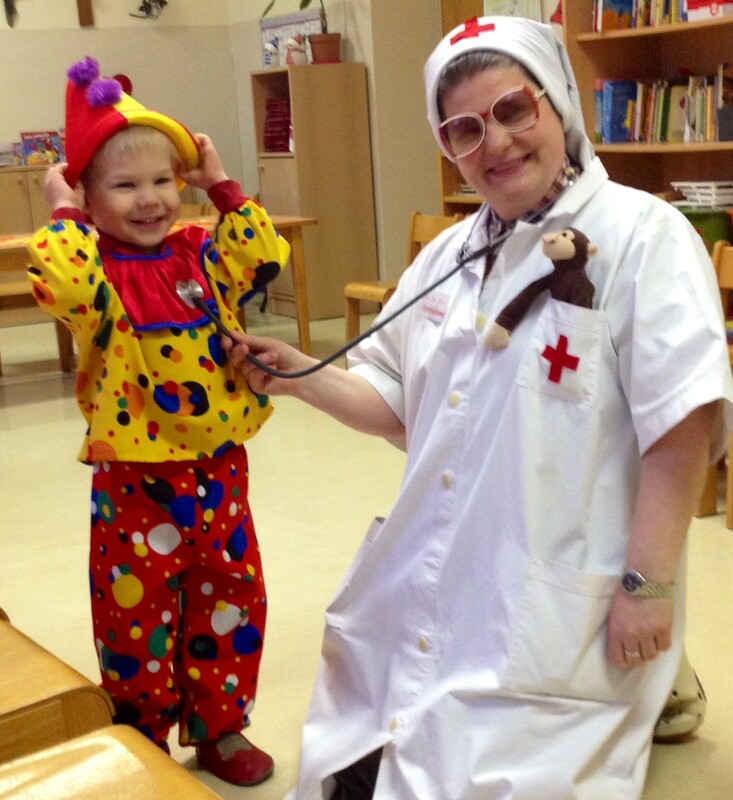 Niki, the clown and his day care teacher, Sister Johanna dressed as a veterinarian. Perfume, just like fancy costumes, can be helpful to be someone else for the day. It can enhance feelings and it can diminish others. When I wear a leather scent my mindset is definitely different from when I wear a wispy floral. So yes, I do play dress up with perfume. Today I am (or have to be) very capable and together and just do stuff without waffling around, although I feel anything but, since I am still recovering form a bout of flu. So what is my scent of disguise? Hermès Vetiver Tonka, it gets stuff done. How about you? Who are you today? 56 Responses to Monday Question – Do You Ever Use Perfume As A Means Of Disguise? Firstly, your son is absolutely adorable in his clown costume! I am so impressed that he chose to be one despite his fear of clowns – how brave of him! We should all take risks like that. In response to the question, I definitely use perfume as a disguise – whenever I feel like I need to be more assertive and powerful I chose something more masculine leaning and strong. If I want to “blend in with locals” I chose something oudh-y or arabic style and if I want to be more coy and sweet (to get my way, of course) I pick something more gourmand or floral. So, even if my mood doesn’t match what I need to be doing, I feel that perfume can help get me into the right frame of mind. Thank you, Dubaiscents! I was astounded at his choice… it is interesting indeed. Glad the idea of olfactorily dressing up as somebody else is something you know well too! Niki is just adorable in his costume! The times where I need to be stronger call for different perfumes. As a disguise I love loud big perfumes when I want to feel like a queen. A strong perfume works like a charm to lend us some confidence. That’s the cutest clown I’ve ever seen 🙂 I definitely sometimes play olfactory dress up. Leathery scents when I need to feel strong and confident- Onda, Mona di Orio Cuir and ELdO Rien are my “yes I’m tougher than thou”-scents. Onda in particular makes me feel strong and confindent, Something gourmand when I need to feel cuddled, and like today, when I really, really feel that it’s spring, PG Drama Nuui to boost that feeling. Happy monday y’all! I can so relate to your tougher than thou perfumes, Onda is excellent in that regard. Scent as a disguise: No, but this is a fantastic idea which I will think through. But a perfume to get stuff done? Great idea and a choice choice. Clowns; never liked them at that age or now. I’d be interested to hear what you come up with once you’ve thought the perfumed disguise thing through. Scent as a disguise? Like when I wear CHANEL 19 to feel focused and empowered? Blonde to feel, um, blonde? Yes, but my whole life is a happy game of dress ups so I’m not sure it counts. Your life IS a constant dress up game, isn’t that just wonderful??? Yes Birgit, I couldn’t have wished for a better or more fun one. YAY!! I am not alone, though today I am wearing Mohur Extrait by Neela Vermeire, but you know what I mean. I hope your day is a good one and No19 does its job well! Niki is supercute – as always! No, I don’t disguise – I might have done so when I was younger, but nowadays if I take a “masculine” parfum (I don’t really belive in those categories) I do so, because I feel masculine that very day. That’s exactly what my choice for the parfume of the day depends on : how I woke up that very morning, how I feel – the varioius aspects of good old LJG. “The various aspects of good old LJG”, I love that. I understand why you have no need to disguise yourself, you have so many lovely sides! Niki is adorable 🙂 good to see a happy clown, I usually find them quite creepy. Scent not so much as a disguise but more of a projection. Bandit when I’m in a f*** off mood and don’t want to feel approachable, vetivers for quiet and serene, wispy florals for easy-going, bwf’s for diva, and more difficult and unusual scents for feeling quirky and wanting to express individuality. Perfume is so helpful when we want to show a particular mood to others. Too cute this clown, I’ve always been a bit scared by clowns but this one is mmmmmmm! I don’t know about an actual disguise, but, a mood enhancer, Yes! I love wearing certain fragrances to set my mood for the day Fragrance is a powerful tool, it can make you feel strong, and beautiful! Right! That is exactly it! Sometimes we wear perfume that is NOT us, that feels alien to us and that is the point of wearing it anyway. Yes, Vengence extreme rather screams “Patchouli! !” at the world, and that is sometimes just what we want, isn’t it? Also you gotta love the name! I can sympathize with Niki’s fear of clowns, as that was one of my big fears when I was a kid. If only the clowns looked as cute and smiling as Niki!!! But they always had eerie smiles, it seemed to me. I don’t think of perfume as being a disguise for me, but I do like to feel like I’m arming myself with some its traits: a sense of joyous polish and beauty (Chanel No. 22) and a sense of tough beauty (Montale Black Aoud) when I need to feel more capable. Those are the two examples that most spring to mind. Great question, Birgit – hope you’re feeling better soon. I’m feeling indeed better, Vetiver Tonka really did its job beautifully. Arming yourself with a perfume’s traits – so well put, dear Suz! Olfactory dress up…I love this, I guess I actually do it all the time! only used California Baby Calming shampoo and body wash…it is fun that we smell the same! It sounds like you use the olfactory dress up to your full advantage. I hope you had a great time with your granddaughter, Darilyn! PS Since when was a pocket monkey a standard item of veterinary equipment? Though I think it is a good move! Wow, Niki will go far in life with that kind of thinking. I am in awe. Great question, B. I regularly use perfume as disguise. I am not Portrait of a Lady or Cuir de Russie but I assume a little of their persona (or kid myself that I do) when I wear them. Thanks for your kind words about Niki. It sure often feels like he knows so well what he is doing, which leaves me amazed. Glad you can relate to the disguise issue too, T.
Thanks for sharing your disguises, rosestrang. Glad you enjoyed the comments here, so did I.
Hmm, interesting. I don’t think I use perfume to disguise myself- life’s too short to wear perfumes that don’t feel like ‘me’. But I will use perfume to strengthen parts of my character that I feel in need of. Cuir de Lancome is perfect for getting through my enormously long and draining Fridays, Gold Man’s powdery civet is perfect for late night dance parties, while Bois des Iles is just right for ballroom competitions. Yes, that is an interesting question. Since my life has had several wildly different segments and each has a fragrance attached to it, I use that fragrance for remembrance. Different scents for different moods also. If I’m doing business, it’s Vol de Nuit; reading, the favorite is Musc Kublai Khan; quiet times it’s Shalimar. When I’m doing actual physical work I play Bach Inventions and wear something that smells like lemon. That sounds like a great strategy! Interesting how a couple here have said they wear Vol de Nuit for self empowerment or business as I always have thought of it as my interview scent. It seems to work in that way for many! I hope it helps (or helped?) getting you a great job, thirteenfive70! What an adorable clown Niki makes! So cute! And such a creative way to confront his fear! As for perfume, sometimes I’ll choose a powerful, leather, get-down-to-business scent if I feel like I need to feel confident and courageous, but I can’t say that I’ve used perfume as a disguise. Sometimes when I wear a scent that I associate strongly with someone, I feel like I am playing dress-up for a day. Does that count? I often feel like perfume is my disguise. If not a disguise, at least my make-up (I don’t wear any actual make-up!). The more disguise-y perfumes are often very pretty and feminine (such as Kelly Caleche, Stella, or Bombay Bling), which contrasts with my pretty frumpy tom-boy-ish style 🙂 I had the hardest time picking a perfume for a networking luncheon last week, and finally decided to go with a dab of Osmanthe Yunnan but regretted it afterward. I think Bois Farine would have been a more strong, yet professional choice! Bois Farine is great for projecting a no-nonsense, business attitude, but I’m sure you did great in OY too. I tend to think of perfumes as being “me” or “not me,” but it never occurred to me to deliberately wear one that isn’t me. I may have to try it, and see if it helps me pretend to be more authoritative, say, or nicer. Forgot to add, everyone would love clowns, if they were all as cute as your son. Try being someone else for a day, it can be fun! That’s a wise decision of Mr. N. to be what scares him. I have never heard of anyone though who would LOVE clowns. Most people I know find them scary, maybe not the the extent of running away, but they give them the creeps! As for perfume as a disguise, I’m with you on that. It definitely helps channel your inner _______ (fill in the blank). I use it consciously, like you do, to enhance and to conceal or to play with unexpectedly.